Tender oat pancakes with raisins – a great option for a family tea party on the weekend. 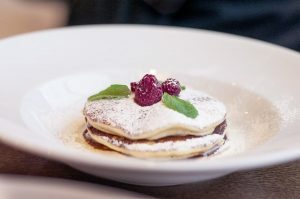 For the recipe of such pancakes, it is best to use instant oatmeal, and instead of raisins, you can add dried apricots, prunes or various candied fruits to taste. Place oatmeal in a blender and grind. Transfer to a large bowl and pour milk, leave for 15-20 minutes. Add an egg and two tablespoons of oil, mix thoroughly. Then add the sifted flour, baking powder, sugar and vanilla sugar, mix until smooth and then stir in the raisins. Fry the pancakes in vegetable oil until golden brown on both sides. Cleans the cells of the body (oatmeal can be compared with a sponge, which absorbs all toxins and slags). Previous PostPrevious What Is the Mediterranean Diet?